We've been big fans of Ash Soan for many years now, and since seeing his clinic debut with Benny Greb in Manchester last year we've been looking forward to seeing him in action again. On this run, pairing Ash with Neal Wilkinson was a masterstroke. Both are masters of the session world, very much in-demand and seasoned pros on the gigging circuit (Neal has survived to tell the tales of touring with Van Morrison). The idea for this clinic tour was particularly unique. 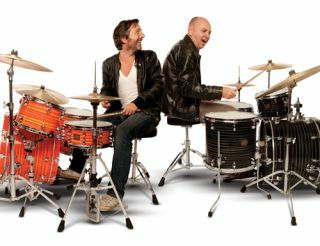 Both drummers would appear on stage at the same time, sat behind their wonderfully warm sounding Yamaha Club Custom kits and, in turn, discuss how they approach the art of making 'music' (a word emphasised throughout the evening) and other elements about the business like working with producers, and tricks for drawing additional sounds from your kit and cymbals. Both drummers contributed throughout the evening interjecting where necessary to offer their own take on the subject and share their knowledge. It's a format that worked very well and gave the clinic a very informal, conversational angle, with audience members encouraged to ask questions at any time. Chops were not the order of the day here. Yes, there was some fantastic playing on display - Ash possesses a tasty shuffle you can only dream of, and Neal's grasp of jazz is astounding - but the majority of what was played this evening, the stuff that these guys get the calls for, are things that you and I can feasibly master with hard work and attention to detail. It's about simplicity, but also the WAY you play those simple parts. Amongst the discussions were fine examples of playing - Ash sat into a lovely shuffle, before his trademark groove through Grace Jones' 'Slave To The Rhythm', and Neal piled on the tasteful restraint during a James Morrison track he recently played on. No bravado, no double kicks. Just genuinely great playing from two of the best and the main message that, you don't have to be a mind-bending player to be good (and get work), but it's always about playing musically and in the context of the song. The penny clearly dropped for many drummers tonight. You can still pick up back issues of Rhythm featuring three month's of video guest lessons from Ash (August, Summer and September issues) here.